Populating domains is the key to internet growth. 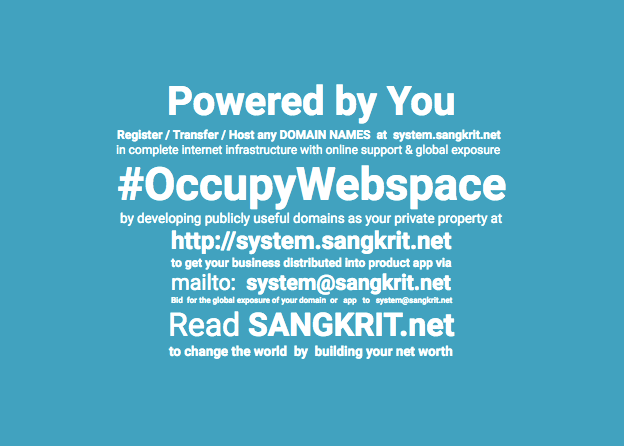 Sangkrit.net works as internet growth engine. It is the program of Sangkrit upon internet that is capable for generating one billion globally distributed self employments via self education in its growth. Every humankind must make full efforts by working as the people’s personal outlet of Sangkrit.net everywhere towards upgrading entire humanity into the internet age. You populate domains upon the http://system.sangkrit.net while work as the people’s personsl outlet of Sangkrit.net so that by helping the client activity there you make money for extending online support. That is way, Internet is going to work henceforth. You have to make this happen.